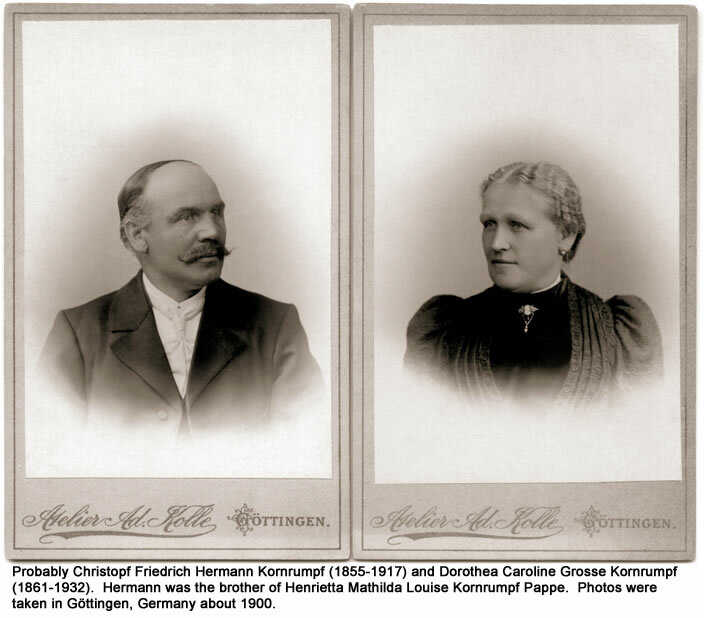 Christoph Frederick Hermann (aka Herman) Kornrumpf and Dorothea Grosse (Kornrumpf) in Göttingen, where Herman operated a successful business (see Göttingen). 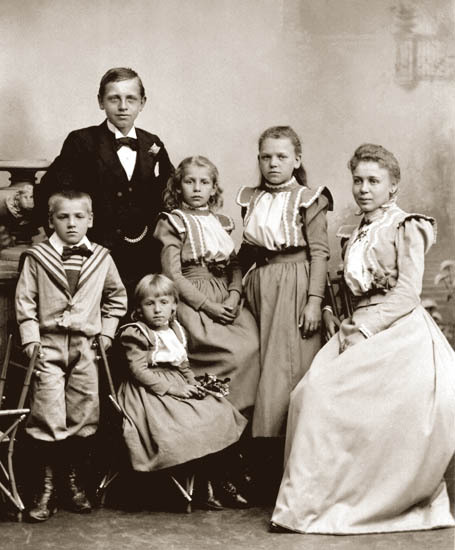 Probably Herman Kornrumpf's children in 1898, just before Amalie and Paul left for America. Photo taken in Göttingen. 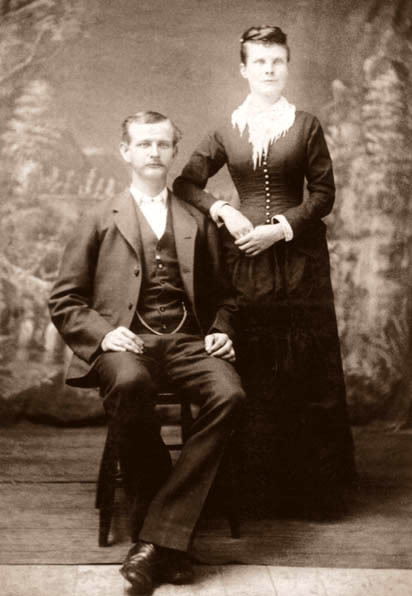 Herman's daughter, Amalia Kornrumpf (Cares) and her husband, Rev. Franz Cares. Photo taken in Saginaw, MI. 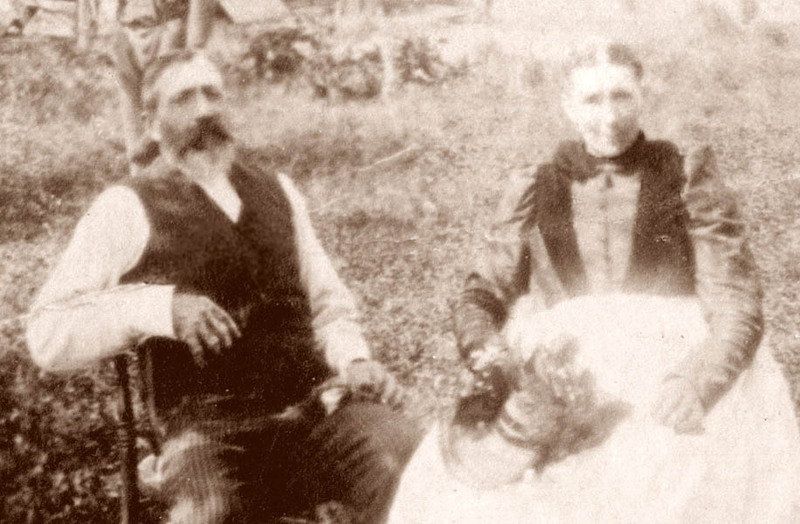 Richard Pappe and Henrietta Mathilda Louise (aka Louise) Kornrumpf (Pappe) and Richard Pappe. Photo taken in Göttingen, Germany about 1880. 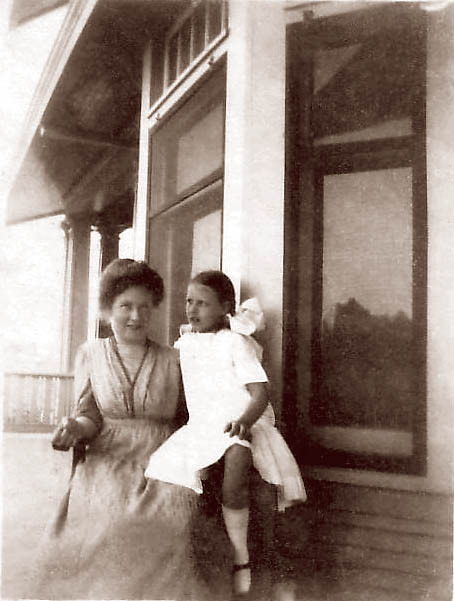 Gerhard (aka Franz) Kornrumpf and Anna Kock (Kornrumpf) in Port Huron, Michigan, about 1900. 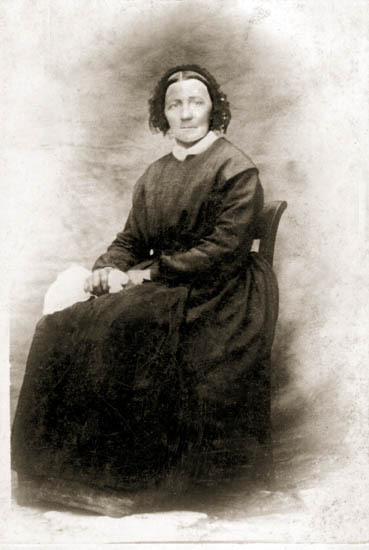 Anna Kock (Kornrumpf). Photo taken in Port Huron, MI. 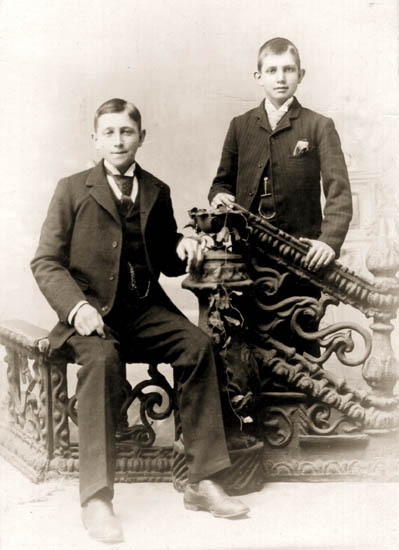 Sons of Franz Kornrumpf, August and Ernest. Photo taken in Port Huron, MI. 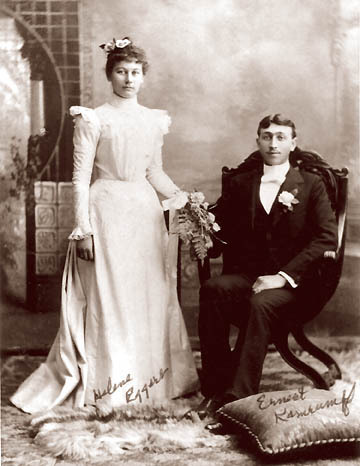 Helen Eggert and Ernest Kornrumpf wedding, about 1900. 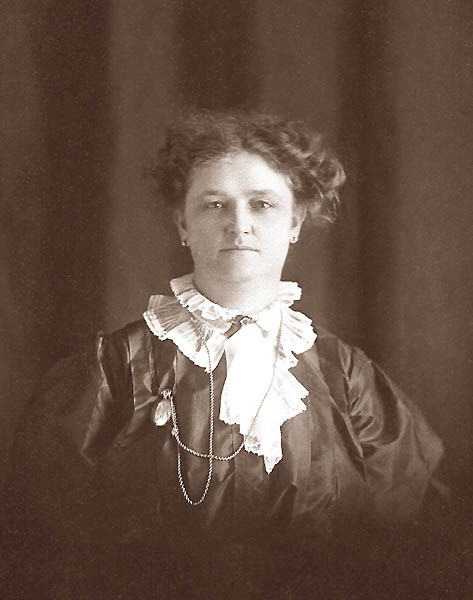 Charlotte Kornrumpf (Engel). 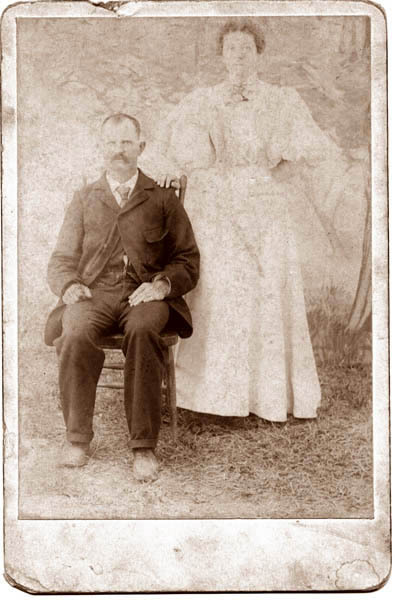 Photo taken in Pratt KS about 1885. Charlotte lived a few miles north of Pratt in Rattlesnake (Hudson), KS. 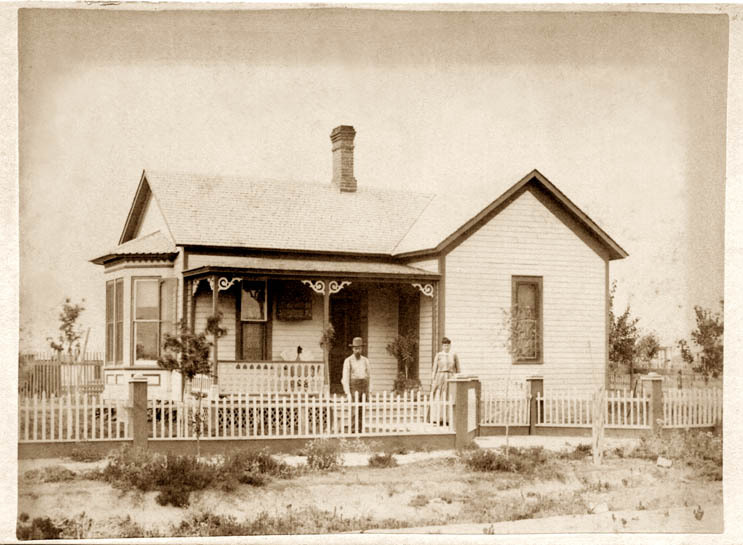 Later the lived in Wisconsin, then homestead in Oklahoma Territory in 1900. 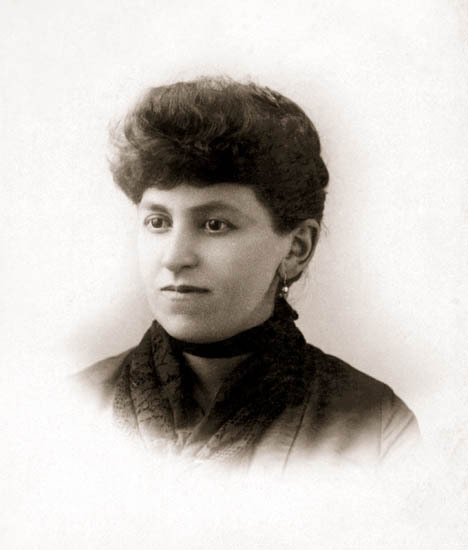 Charlotte Kornrumpf (Engel) and two of her nine children died in a tornado in southwest Oklahoma 1905. 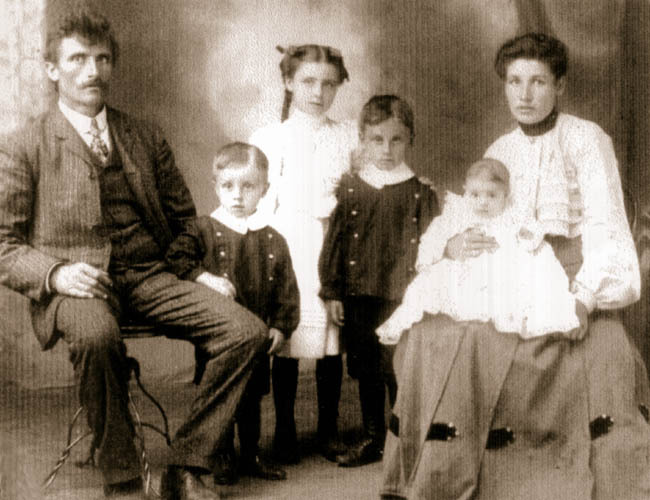 These are believed to be five of her six surviving daughters, about 1910. 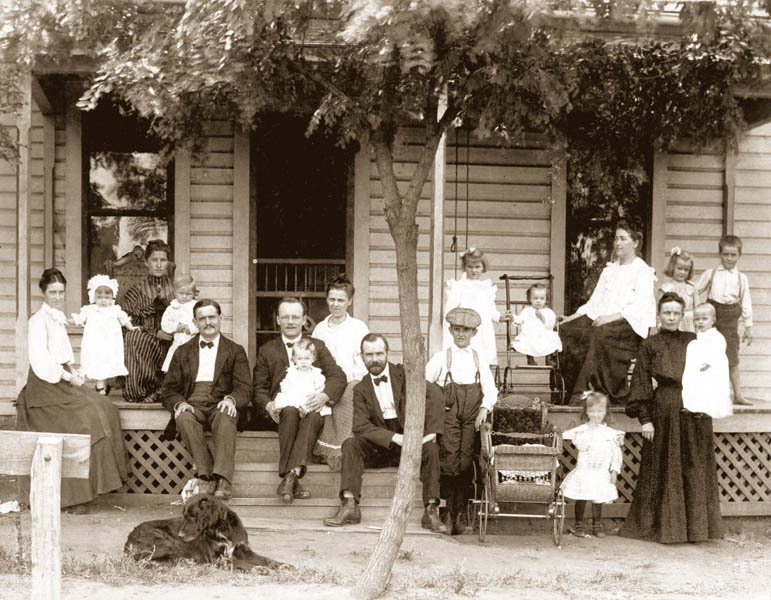 Louise Kornrumpf Pappe and her family in Kingfisher, Oklahoma Territory, about 1893. More info on the Pappe Homepage. 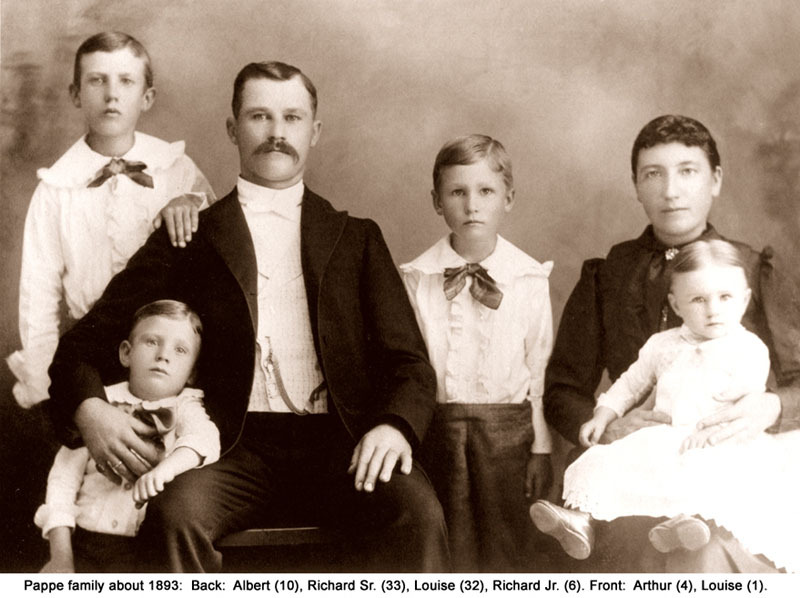 Gertrude Engel Bahr (1880 - 1935), first of Charlotte Kornrumpf Engel's eight daughters, with husband, Richard Bahr and children (L to R) Fred, Rosalie, Albert and Lourinda (infant). 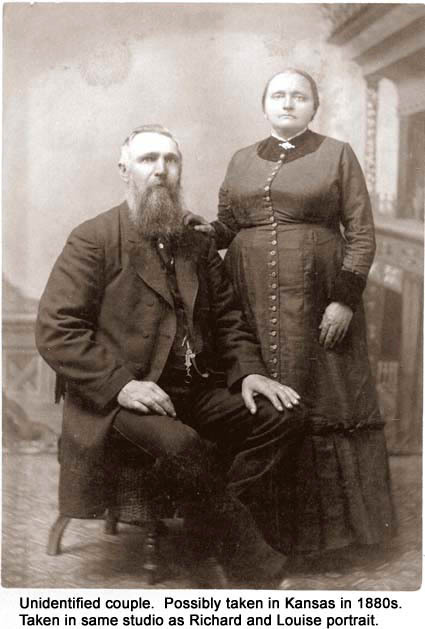 The Bahr family lived in Wisconsin. 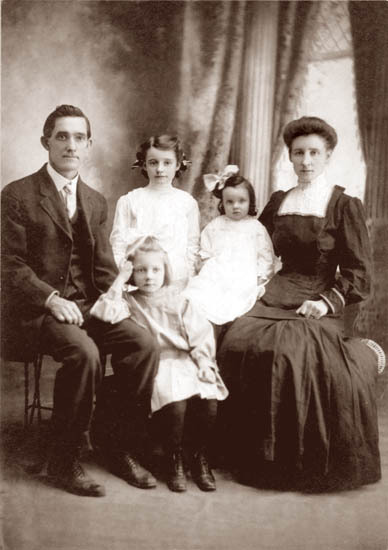 Pearl Engel Lowrey, third of Charlotte Kornrumpf Engel's eight daughters, with husband Emory Lowrey and daughters Thelma, Valerie and Lahoma. 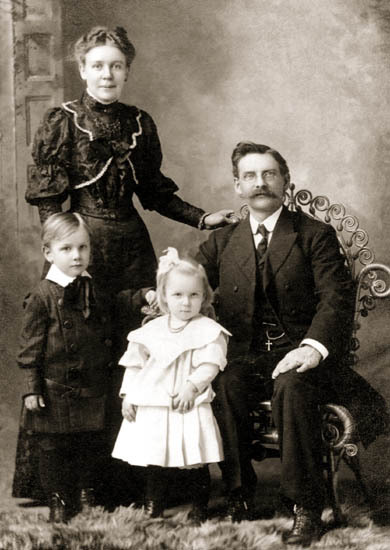 The Lowrey family lived in Kingfisher, OK. 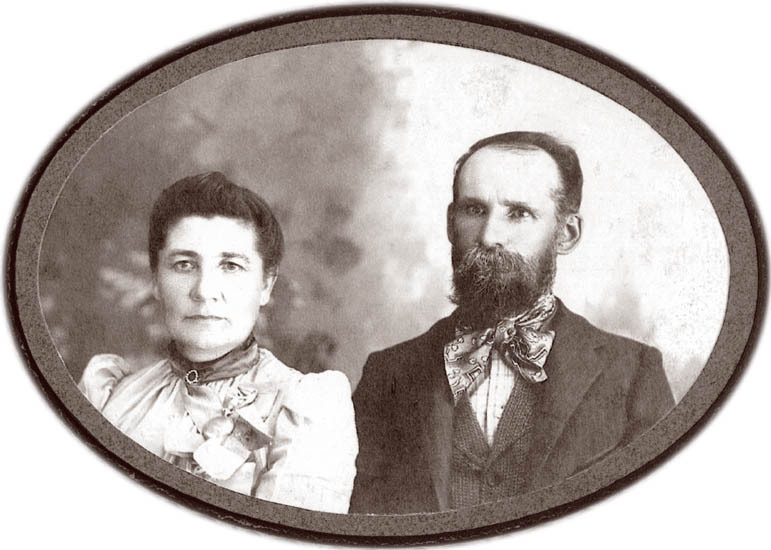 The photo was taken about 1911 in Kingfisher, OK.
Louise Kornrumpf (Pappe) and husband, Richard Pappe in Pratt, KS, about 1885. 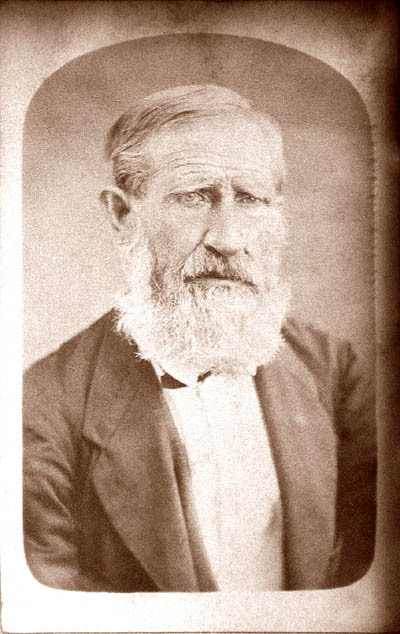 Heinrich Friedrich Wilhelm "Willi" Kornrumpf (1809-1881), about 1880. 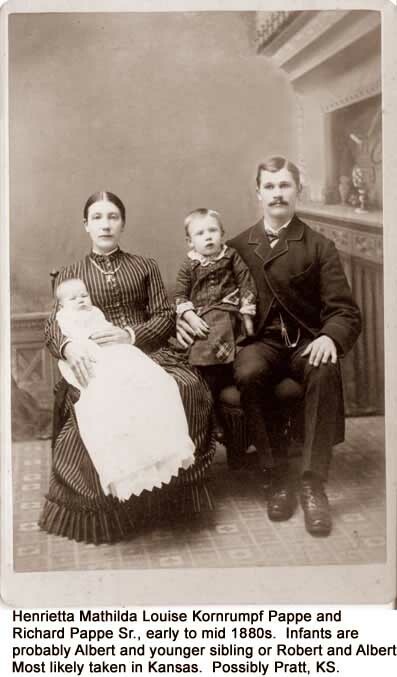 Willi was born in Gross Lengden but he emigrated in 1856 with his wife and seven children, who were all born in Klein Lengden. They settled in San Antonio, Texas. Later generations changed their name to Kornrum. 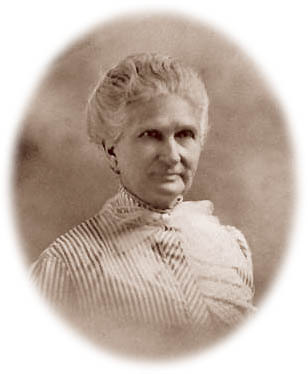 Christine Caroline (Bleyer) Kornrumpf (1813-1904), about 1895. 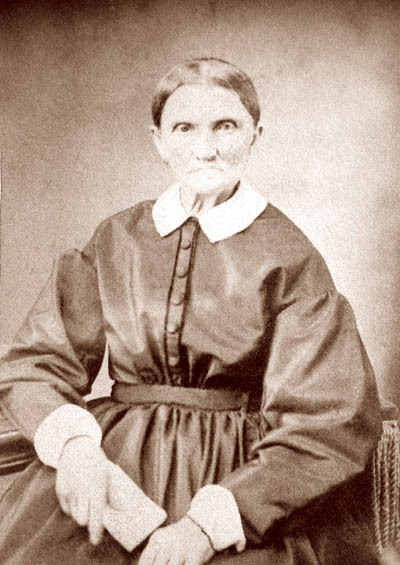 Caroline was the wife of Willi Kornrumpf (1809-1881). 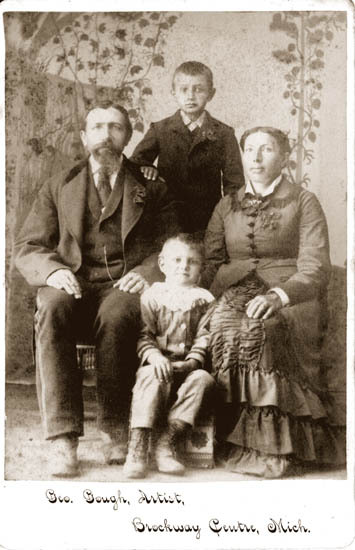 The family emigrated in 1858. 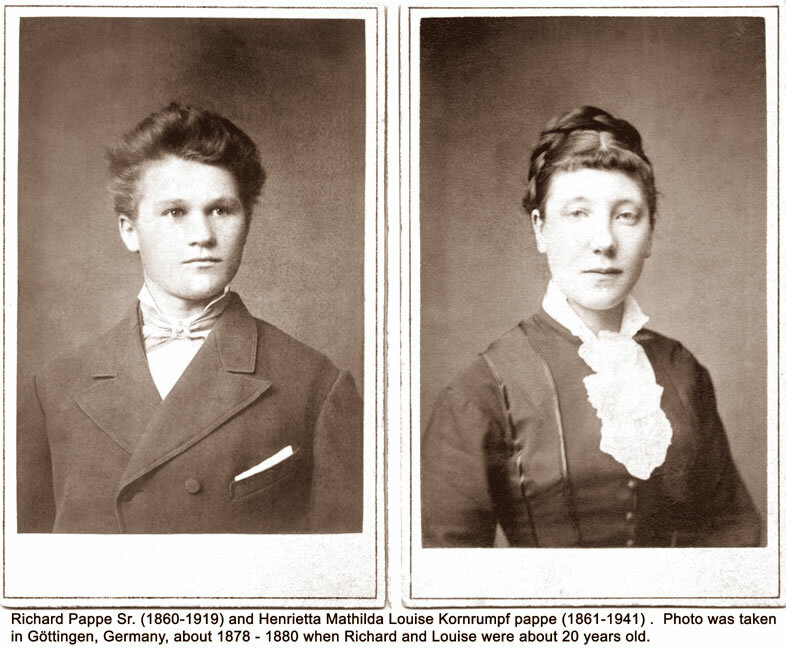 The man looks somewhat like Franz Kornrumpf, but the woman does not look like Anna. 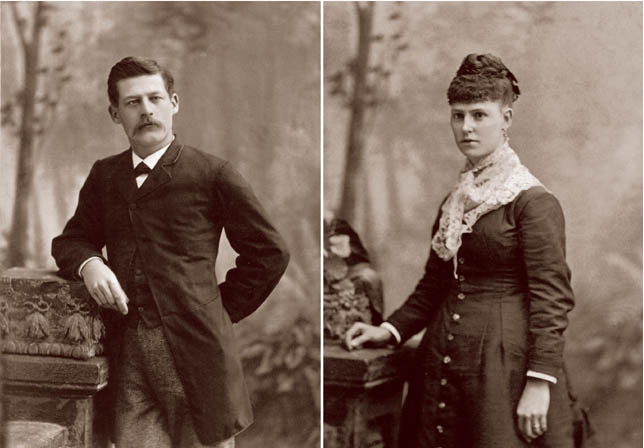 The photo was taken in Brockway Center, MI, which was the neighboring township west of Greenwood Township, where Franz and Anna lived. If you can identify any of these people, please contact the webmaster.